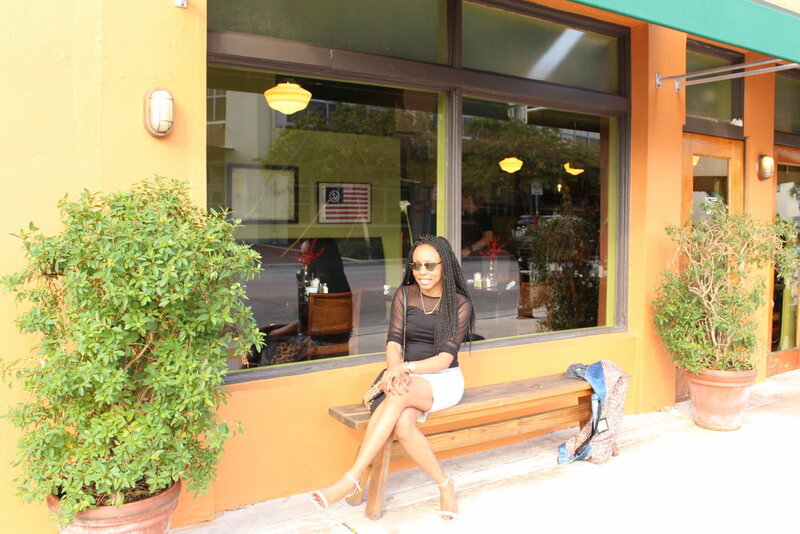 Food & Fashion: Brunch in Downtown Fort Lauderdale — . Upon being greeted warmly by the host, J and I decided to sit outside to enjoy the nice weather. I was surprised to discover (per a note on the menu) that the O-B House is a "no tip" restaurant. The host informed me that the employees are salaried, hence the rule. J and I ordered an assorted breakfast - french toast, pancakes, sausage, eggs and bacon. We wanted the works. Everything (and I mean everything) tasted delicious. I am going to credit that to the quality ingredients. Do you like toast with savory melted butter? creamy well-seasoned scrambled eggs? and freshly made waffles? If you answer yes to any or all of these, then you will like O-B House. Overall, we enjoyed a wholesome and hearty brunch while chatting about our careers, goals, dating, and life in general. J opted for a hi-lo maxi skirt, heels, a tee and jean jacket.